Take students on a field trip without leaving the classroom! Students get practical geological field experience by studying and analyzing data and samples from the Wood River Quadrangle in Illinois and Missouri. Students also learn to think like geologists, applying the field evidence gathered to make decisions regarding economic and environmental land use. The lab activity comes with all the materials you need to outfit a class of thirty students. An exercise with real-life applications, this two-part activity teaches students where the limited resources of coal and oil come from, and how geologists find deposits. Students draw a structure contour map of an Illinois oil field and use electronic log data to determine where to drill for oil. Then students analyze and test actual samples from a coal mine in the map area to learn about depositional environments and stratigraphic relationships. 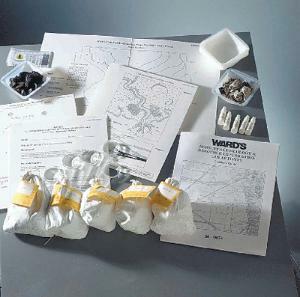 It comes with five coal and rock samples, testing materials, map worksheets, copymasters for student activities, and a teacher’s guide.